We received the mentioned product as a part of the Chewy.com Influencers program. The thoughts contained within this post are ours and may vary from the thoughts of others. Help your cat keep her litter box clean while keeping your home odor-free with Dr. Elsey’s Clean Tracks cat litter. This fragrance-free litter is gentle on noses and paws but tough on odors. It’s 99% dust-free and offers low-tracking benefits for every pet parent’s convenience. Made with natural ingredients, the medium-grain clay helps to keep the litter where it’s supposed to be—right in her litter box! It’s also 100% free of deodorants, perfumes and chemicals and is also hypo-allergenic, which means it’s great for sensitive cats and pet parents alike. Not only will your house maintain its natural freshness, but the multi-strength, hard clumping formula makes cleaning especially easy after each use. Upgrade your kitty’s litter box, she deserves it! Fragrance-free formula is purr-fect for cats and pet parents who are sensitive to scents. 99% dust-free formula allows you and your feline friend to breathe easy. Multi-strength litter is made with natural ingredients and is perfect for multi-cat households. Hypo-allergenic littler contains no plant proteins, which means it’s great for cats and pet parents with certain allergies. Made in the USA without chemicals and packaged in an easy-to-carry box with a handle and easy-pour spout. Cat Litter that is less than $11 for 20 pounds– Can’t beat a good deal especially when it is brought right to my porch by our trusted Fed Ex driver! I always wonder though if the good deal will stand up to the use of 3 indoor cats who happen to be males. These boys stink– anyone who has a male cat knows what I am talking about. All of our guys have been rescues of some sort and we love them, but phew! 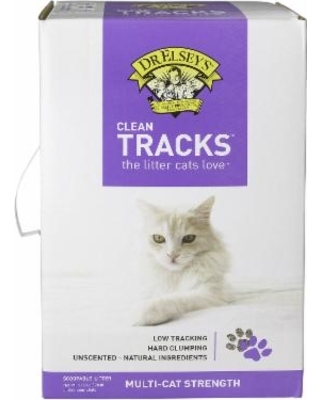 When we first tried the Dr. Elsey’s Clean Tracks Cat Litter the first thing I noted was that it was easy to pour from the box. I didn’t spill a ton on the floor like I have done with other litters. The boys went right to it to inspect as they always do with a fresh pan of litter and they all approved! Step one of this mission was complete.. they used the litter without turning up their noses. I found that this litter did not track all over the house and that it was easy to scoop. The house didn’t stink and the cats were happy. All is well in the world when you have happy cats and I didn’t feel like I was trapped in a Febreeze commercial having to spray tons of products in the house to eliminate litter odor. If you are looking for a great company that sends pet supplies right to your door then look no further than Chewy.com! !